We boast a storied past of traditions, liturgy and doctrine. Organized Lutheranism in Lancaster began with the founding of Trinity Church in 1730 and their early involvement in the Ministerium of Pennsylvania in 1745. However, by the Civil War, Pennsylvania Lutheran attitudes had coalesced into two dominant groups: the Ministerium and its eventual larger group the General Council (founded 1867), which emphasized historical Lutheranism, liturgy, and doctrine, and the General Synod (founded 1820), which emphasized more personalized pietism with less regard for specifically Lutheran traditions, liturgy, and doctrine. The two groups focused their attention on theological education at Philadelphia (Mt. Airy) and Gettysburg Seminaries, respectively. Midsized towns in Pennsylvania often had two Lutheran churches with different pastors, aligned to the two larger groups. For example, churches in the Ministerium of Pennsylvania tended to serve communion with wine and pastors wore clerical collars and robed in surplice and stole and those in the Central Pennsylvania Synod served grape juice and pastors wore black Geneva preaching gowns. On May 26, 1953 these two groups in Pennsylvania agreed on territorial boundaries that did not cross each other, but the distinction between the two groups began to blur over time. 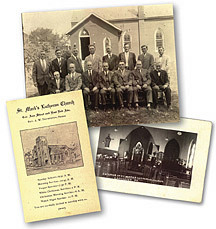 Both Advent and St. Mark's congregations, which later merged to form Good Shepherd, began as Ministerium members, with St. Mark's tending more toward General Synod style. By the time of their merger in 1971, the effect was similar to the effect of the previous merging of the Ministerium and the General Synod. See a timeline of the congregation's life.